The Florida Public Transportation Association (FPTA) is one of the most active state transit associations in the nation. We represent urban and rural systems across our state, with our programs providing over 277 million trips to Florida residents and visitors. 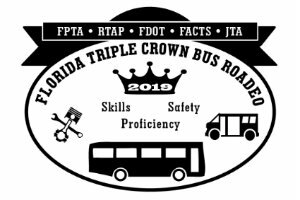 The Florida Triple Crown Bus Roadeo, held on April 5-6, 2019 in Jacksonville, honored Florida’s paratransit and fixed route bus operators and maintenance technicians. We’d like to thank the incredible staff of our host, the Jacksonville Transportation Authority (JTA), as well as our sponsors listed below. FPTA is again asking for donations from the Transit Industry to assist with Hurricane Michael recovery. We are seeking gift cards, checks or donations via credit card. Lisa Bacot will be purchasing gift cards for any check or credit card donations. We thank you so much for your generosity! !